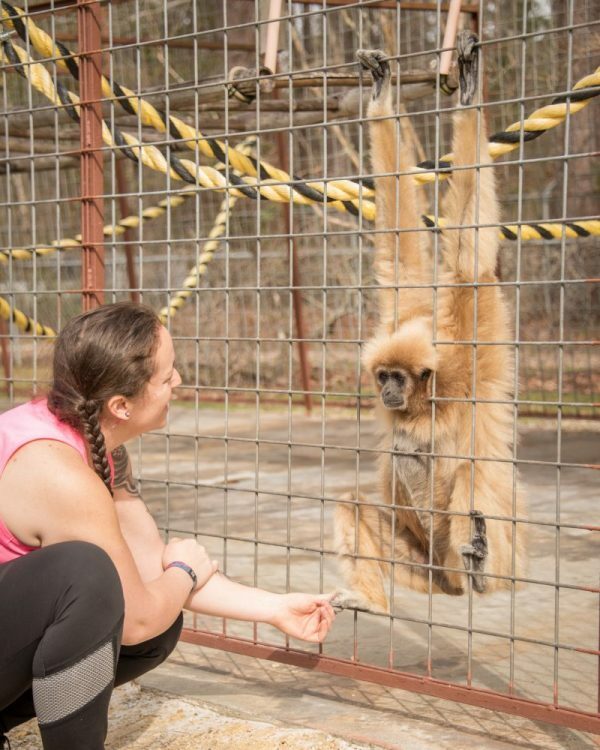 Crescent Homes spent the afternoon with some of the cutest local residents around at the Gibbon Sanctuary operated by the International Primate Protection League located in Summerville, SC. IPPL, was founded in 1973 in Thailand, but found its way to the Lowcountry in 1976 and is currently home to 34 gibbons and 4 otters. 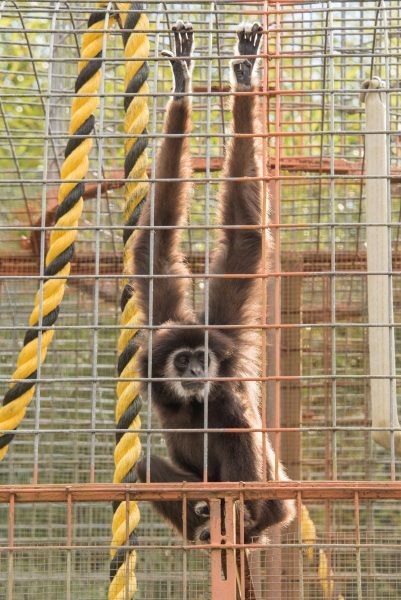 The rescued gibbons come to IPPL after former ‘careers’ as laboratory subjects, neglected pets and zoo exbibits. For many of these furry residents, life at the sanctuary is the first time they have experienced proper veterinary care, compassion and love. The sanctuary consists of 37 total acres, each gibbon has their own space or shared space with their mated pair (gibbons are monogamous!) and enjoys plenty of room for activities and many interactive toys including swinging ropes, hammocks, climbing structures, PVC tubes and even TV when they’re indoors. The gibbons are fed a diet of beans, scrambled eggs, a lot of fruits and veggies and a banana before bed daily. Financial contributions to IPPL go to providing nutritious meals, upkeep of the facilities and continuous veterinary care. 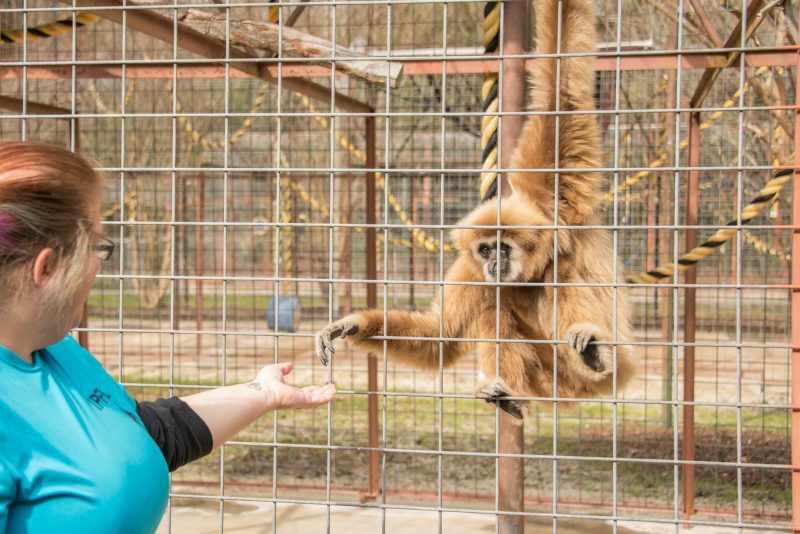 IPPL also helps two dozen primate sanctuaries around the world with their small grants program. 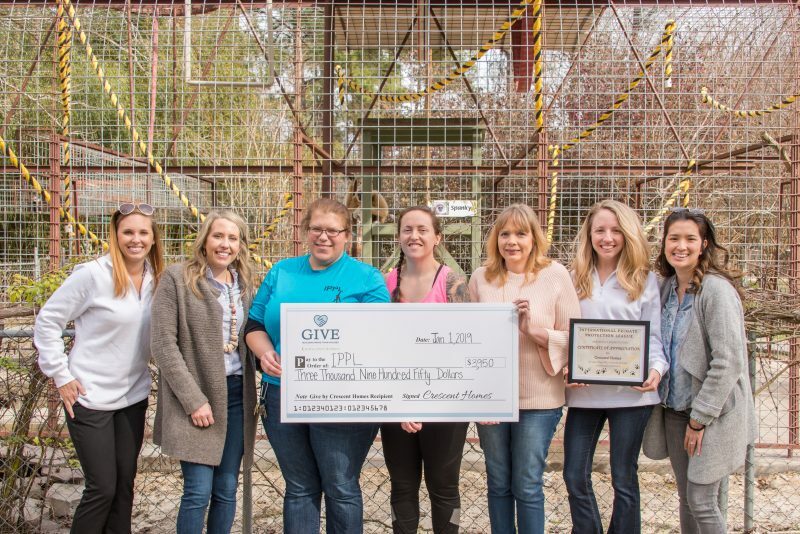 The International Primate League was one of five local nonprofit organizations selected by Crescent Homes for 2019 Q1 of GIVE and received $3,950 for the quarter. The philanthropic program, which launched in April 2017, pledges $250 towards a local charity for each home sold, allowing the homebuyer to choose the organization their contribution will go towards. Crescent Homes selects five new organizations each quarter, with the intention of not only financially supporting these worthwhile organizations, but also to bringing awareness to the incredible work they do. As a local company, we wanted to really hone in on a way to give back to the community which supports us. We like to tour the different facilities and be a part of their different events to not only see how these nonprofits do what they do on a daily basis but also see how they give back to the community. Crescent Homes is continuously looking for recipients for their GIVE program. To be considered or to recommend a nonprofit organization, please contact: GIVE@CrescentHomes.net.